Tag Archive | "prince william and kate middleton"
Just a few hours just before the most anticipated royal wedding, Kate Middleton along with her bridesmaids and best man Prince Harry rehearsed for the second time on Thursday at Westminster Abbey. The wedding on Friday is expected to display elegance at top scale with royal carriages, as well as Household Calvary mounted troops. Union Jacks- the red, blue and white-colored flags of United Kingdom- covered the entire parade route. Meanwhile, pavements have been scrubbed with street cleaners. The couples have invited 1,900 guests to their wedding. However, thousands are expected to gather around the parade route from the Westminster Abbey to the Buckingham palace after the ceremony on Friday. The church, as well, has been revamped into a beautiful forest. Two hornbeams and six field maples lined-up in the aisle to the altar. Five thousand police officers are expected to go on duty on Friday. They will look out for protesters, anti-monarchists, hooligans and anti-monarchists who might ruin the royal event. Also, police patrols will be distributed around the area. Other wedding details include: Kate Middleton will walk down the aisle with the hymn of “I was glad” from the Psalm 122. It is an anthem setting composed by Sir Charles Hubert Hastings Parry. Also, Middleton will say to “love, comfort, honor and keep” him, instead of her promise to “obey” her husband in the wedding vows. Yet, Prince William and Kate Middleton, in their message in the wedding program, say they were deeply touched with the affection everyone has showed them. All eyes are on Britain’s royal family nowadays with the royal wedding coming to a close. Prince Harry is as in to the wedding preparation as the groom-to-be is. Prince Harry just got back from a charity trek of 200 miles in the Arctic. However, he had enough time to throw his brother a very successful stag party. Reports say that the young prince did not only plan the party, he also participated in the wedding reception organization at the Buckingham Palace. A palace aide confirmed that Prince Harry decided on the playlist, the DJ, food ideas, and also the cocktail menu. The reception is divided in to two and the second half is dedicated for the younger crowd. Prince Harry basically took care of everything in this area, living the wedding planner with practically nothing to worry about. While everything is almost all set, sources said that the wedding cake is already in the palace, a list of attendees was leaked. 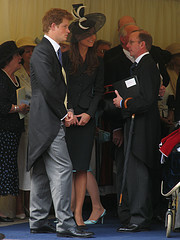 The list includes six shocking personalities – exes of both Prince William and Kate Middleton. The wedding will allegedly be graced by Kate’s ex-boyfriend Rupert Finch and Willem Marx. On the other hand, William also invited his exes Arabella Musgrave, Rose Farquhar, Jecca Craig, and Anstruther-Gough-Galthorpe. This report is not yet confirmed but three palace sources have already confirmed this. However the wedding will take place, one thing is for sure, Harry’s on-and-off girlfriend Chelsy Davy is in the guest list. One of Harry’s friends said that Chelsy will definitely be there; being the most important girl in Harry’s life.